Beautifully engraved specimen certificate from iVillage.com dated 2001. This historic document was printed by the Security-Columbian Banknote Company and has an ornate border around it with a vignette of the company's logo and and underprint of children holding hands. This item has the printed signatures of the company's CEO/Chairman and Secretary. iVillage is a new media company, which operates iVillage.com, Lamaze Publishing and the Newborn Channel. iVillage.com is a leading women's online destination providing practical solutions and everyday support for women 18 and over. Lamaze publishing produces advertising-supported educational materials for expectant and new parents. The Newborn Channel is a satellite television network in over 1,000 hospitals nationwide. iVillage.com is organized into branded communities across multiple topics of high importance to women and offers interactive services, peer support, content and online access to experts and tailored shopping opportunities. Content areas include Astrology, Babies, Beauty, Books, Computing, Diet & Fitness, Food, Games, Health, Home & Garden, Lamaze, Money, News & Issues, Parenting, Pets, Relationships, Shopping, and Work. Established in 1995 and headquartered in New York City, iVillage Inc. (Nasdaq: IVIL) is recognized as an industry leader in developing innovative sponsorship and commerce relationships that match the desire of marketers to reach women with the needs of iVillage.com members for relevant information and services. 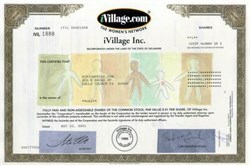 Membership to iVillage.com is free and offers features such as email, personal homepages, instant messaging and other community tools. Company information is from the iVillage.com website.